The Lowell Spinners kick off their season on Friday night with a 7:05 tilt against the Vermont Lake Monsters featuring a roster heavy on returning talent as compared to new draftees. The opening night roster features 25 players who were in the system last year, including two players on rehab assignments. 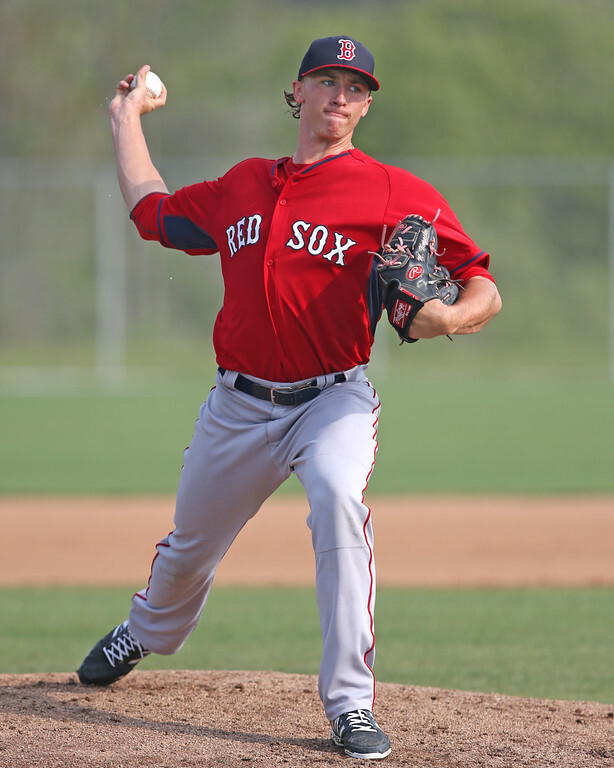 Headlining the roster is a player who is not expected to be in Lowell for long, that being right-handed pitcher Michael Kopech (pictured). Currently ranked sixth in the system by SoxProspects.com, Kopech is rehabbing from a broken pitching hand suffered during spring training and will be making his first official start since July 12, 2015, following a 50-game suspension that cut his 2015 season short and after rehabbing in extended spring training. Presumably, his time with the Spinners will be brief before moving up to either Greenville or Salem. Kopech will be joined in the Spinners initial rotation by right-handed pitchers Josh Pennington and Kevin Steen, and left-handed pitchers Darwinzon Hernandez and Enmanuel De Jesus. Pennington (35th), Steen (51st), and Hernandez (59th) are ranked in the SoxProspects.com top 60. Fire-throwing right-hander Gerson Bautista (49th) headlines the arms slotted for the Spinners' bullpen. In the lineup, outfielder Yoan Aybar (26th) and infielder Victor Acosta (54th) will be the anchors to start the year, joined by a number of intriguing names, including second baseman Jagger Rusconi and first baseman Jerry Downs, the Red Sox' fifth- and 15th-round selections in last year's draft, and catcher/third baseman Roldani Baldwin, who has spent the season with Greenville but is officially on a "rehab assignment" with the Spinners. The first four draft signings announced by the Red Sox are also on the opening night roster, as outfielders Ryan Scott (seventh round) and Matt McLean (ninth round), and infielder Nick Lovullo (20th round), who all signed as college seniors, and catcher Nick Sciortino (17th round), who signed following his junior season at Boston College, will provide depth. Several more draft picks are expected to join the club in the coming days and weeks, and should provide much of the star power in the lineup. Shortstop CJ Chatham, the 51st overall pick in the 2016 draft, is likely to take over duties as the club's starting shortstop once his signing becomes official, as he has reportedly agreed to terms. Pitchers Steve Nogosek (sixth round) and Mike Shawaryn (fifth round), the former having already agreed to terms as well, should join the club's pitching staff, likely in short stints at the start of games as they ease their way into a five-day rotation. University of Florida closer Shaun Anderson (third round) and University of Arizona third baseman/pitcher Bobby Dalbec (fourth round) will both be competing in the College World Series, which begins Saturday, but can be expected to join the Spinners as well once their college teams' seasons come to a close. * - Pitcher Jeffry Fernandez is listed on the Lowell roster, but as a "paper move," as he is still with the Greenville Drive.